From Goodreads: In the early 1980s Ada and Stefan are young, would-be lovers living on opposite sides of the Berlin Wall–Ada lives with her mother and grandmother and paints graffiti on the Wall, and Stefan lives with his grandmother in the East and dreams of escaping to the West. I really enjoyed the back and forth narrative style of this novel, alternating chapters between Ada and Stefan, two lovers divided by the Berlin Wall. While this story is technically about Ada trying to survive in the West and convince Stefan to scale the wall from the East, in truth, it’s really not about their relationship, per se, but rather about their individual struggles on their sides of the wall. East Berlin’s fascist government limits any and all freedom, while West Berlin struggles with extremely poverty, squatters, and immigration. It’s a touching story, though it isn’t what I was expecting going in. I had it in my mind that this would be a romance story about overcoming barriers, but that isn’t its focus at all. Instead, it focuses on the West, on Ada and her struggles as a squatter working in a daycare for foreign children during a time when foreigners had no rights and atrocities abounded. It focuses on survival and injustice, on a time period we don’t hear much about in school. And it’s beautifully written. Coming out of this novel, my interest has definitely been piqued concerning the building of the wall and the circumstances that lead to its coming down. As this isn’t a topic we really discuss in schools, and it’s not something I ever learned about aside from a glancing comment here or there, this novel really opened my eyes to some of the things happening in Germany from 1961-1989, yet I still don’t know enough about the how or why to understand all of the situations that Ada and Stefan find themselves in within the novel. Likewise, it was sometimes hard for me to understand what Ada or Stefan were doing because, again, this isn’t a topic I am extremely familiar with, and I feel like readers should be when going into this story. So, if you’re like me, I highly suggest you do a little research before picking up this YA novel so you don’t find yourself confused. 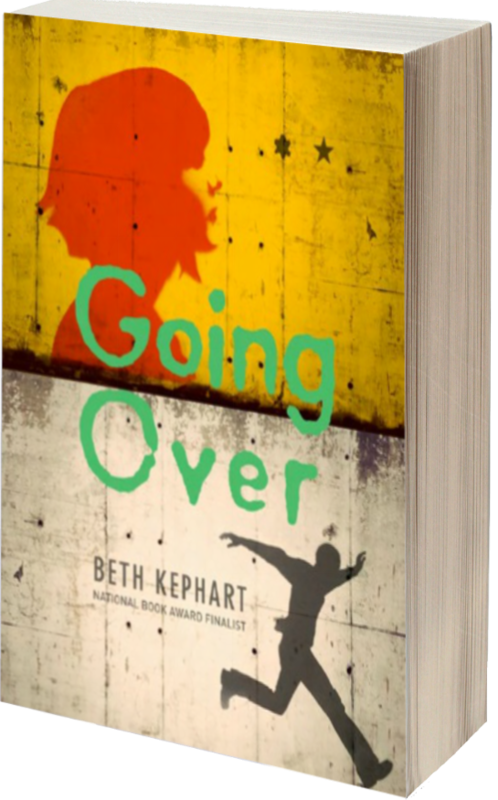 Going Over isn’t a history book by any means, but rather a fictional piece Kephart created after visiting Berlin and researching the wall. It is easy to read and I definitely plan to put this on my Outside Reading list for students because I think it’s an interesting read, with lots of historical information, and if it sparked my curiosity to learn more about Berlin and the wall, then I know it will do so for my students as well. Three and a half stars. In exchange for an honest review, Chronicle Books has been extremely gracious in allowing me to read an ARC of this novel, via edelweiss, prior to its release on April 1, 2014. By reading this review I definitely want to read this book!